Cometto Industries specialises in the design and manufacture of multidirectional, self-propelled vehicles for heavy-duty transport and customised machines for a variety of industries, such as oil and gas, petrochemical, power, nuclear, aeronautic, aerospace, shipyards and steelworks. Thanks to electronic steering, these vehicles are manoeuvrable in confined areas and are particularly suitable for the displacement of big modules for power and nuclear industries, offshore platforms and wind power plants. Cometto’s lifting transporters series have loading capacities of more than 1,000t and their platforms and transporters are suitable for internal logistics. The main features of these series are the all-wheel steering, allowing any type of movement, and the remote-controlled synchronisation between separated vehicles. Cometto produces several tailor-made models, which are customised according to customers’ needs. Cometto’s HDT and MS modular trailers efficiently and flexibly execute any transport project, whether it is in plant or on road. The standardised basic modules, which may be coupled back-to-back or side-by-side and combined with drawbars or goosenecks, can adapt the vehicle to the different payload requirements and are upgradeable, to satisfy future requirements. Many models are available, fixed or extendable from two up to eight axles, with low or flat bed in order to transport different customers loads. Cometto’s technical support team ensures high and consistent efficiency of its products during their service life and assists clients to achieve optimum performance from their investments. Qualified and certified technicians are available to provide support and prompt interventions worldwide. All spare parts in stock are supplied within 48 hours from receiving the order. From 15 to 22 June, the first ever attempt of transporting a gigantic ship block (approximately 14,750t) in South Korea has been carried out at Goseong using a fleet of Cometto MSPE EVO2. The Cometto self-propelled transporters are sturdy, safe, reliable and simple. Cometto heavy duty modular vehicles with load capacity from 60 to over 1,000 tonnes can perform any transport project, both in plant and on road, efficiently and flexibly. 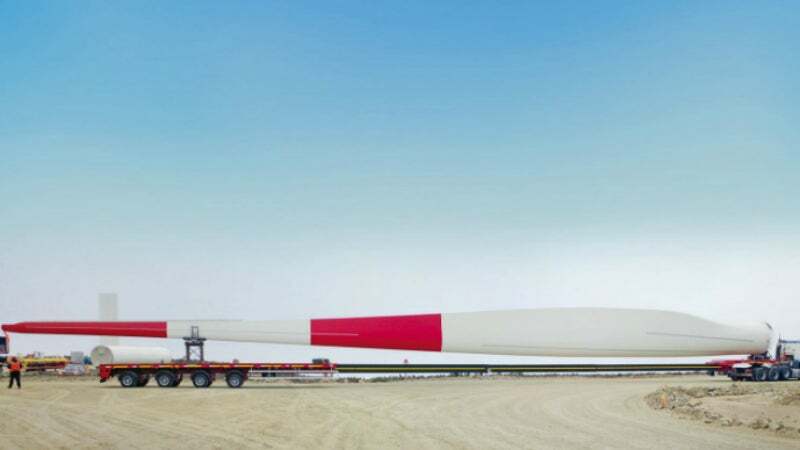 Flat and low bed semitrailers, designed for the transport of long indivisible self-supporting loads, are the only solution for the transport of today's longer wind turbine blades. Cometto self-propelled modular trailers (MSPE) provide a complete transport system for industrial installation, Ro-Ro operation and heavy cargo. The Cometto range includes lifting platform transporters from 20 tonnes to over 1000 tonnes, for the displacement of any kind of loads and specific applications. Whatever your field, Cometto can build the right vehicle. Industrie Cometto S.p.A., Italian manufacturer of trailers, semi-trailers and self-propelled vehicles presented three main innovations. Cometto Industries will be attending Caspian Oil & Gas 2016. COMETTO recently attended at GIS 2015 in Piacenza, Italy.